Online Banking & Bill Pay is a secure service that gives you instant access to all of your Planters Bank accounts. Enjoy the convenience of banking on your own schedule from any location with a computer and Internet connection. Passwords, multi-layered authentication and encryption technology keep your account information private and secure. We recently improved our Online Banking System and added a host of new features. Watch a Demo Tutorial and see how convenient Online Banking can be. Bill Pay Enroll. It's easy to enroll. Click here to return to the home page to log in to Online Banking. Then click on the Bill Pay button and follow the instructions. In addition to stopping by any of our convenient locations, you can now deposit checks for free even on the go ... it's like having a Planters Bank teller wherever you are! 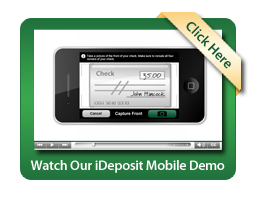 With a simple snap from your smart phone's camera your check deposit is in the bank. Learn more about iDeposit Mobile or click below to watch this helpful demo. E-Statements are fast, simple, and secure. Plus, they are conveniently accessible through online banking with no separate password. If you do not already have an Online Banking account, simply click the "First Time User" link on the green Account Access section of our home page (www.plantersbankonline.com.) Accept the terms and conditions, enter the requested information, and click submit. You will receive an email confirming your enrollment. Within Online Banking, simply click the Documents tab to retrieve your statement. If you have forgotten your Login or Password for Online Banking and Bill Pay, please call us at 886.9030 in Hopkinsville or 552.0654 in Clarksville. Planters Visa® Check Card with U-Choose RewardsSM – Worldwide acceptance means your Check Card can be used at millions of locations throughout the world. Get cash and account information from any ATM nationwide displaying the Cirrus and Pulse logos. Plus, all of your check card transactions are shown on your monthly checking account statement. Planters Visa® Credit Card – We offer a variety of credit cards to meet your needs. Become a card member and enjoy a wide range of benefits including competitive introductory rates and your choice of rewards programs. You can even put your favorite photo on your credit card! It's easy to do and a fun way to show your personality whenever you shop. Click here for more information and to apply online.